Square One Shopping Centre offer more than 327 brand name stores. Square One Shopping Centre is located in Mississauga, Ontario - 100 City Centre Drive, Mississauga, ON, L5B 2C9 (GPS: 43.588613, -79.645729). Look at the list of stores in Square One Shopping Centre, hours, location and information about mall and special events, sales, coupons. You can choose store from list below and get detail information - other stores locations for the brand, location, shopping hours, phone, map, directions contact. Square One Shopping Centre is one of the best shopping place for spend your free time - mall/shopping center has all types of stores - outlets, department, fashion, traditional and more. Have you ever visited Square One Shopping Centre? Do not forget to write shopping review and rate your satisfaction. Square One Shopping Centre is a premier shopping centre located in Mississauga. The largest shopping centre in Ontario is situated right off Highway 403 and Hurontario Street, 30 minutes from downtown Toronto and 15 minutes from Toronto Pearson Airport. The centre is accessible by a public transport from Square Bus Terminal and The City Centre Transit Terminal which is situated on the northwest corner of Square One Shopping Centre. The centre was opened in 1973 and is owned and managed by Oxford Properties Group. Square One Shopping Centre is annualy visited by 24 million shoppers, who and spend here 84 minutes in average. 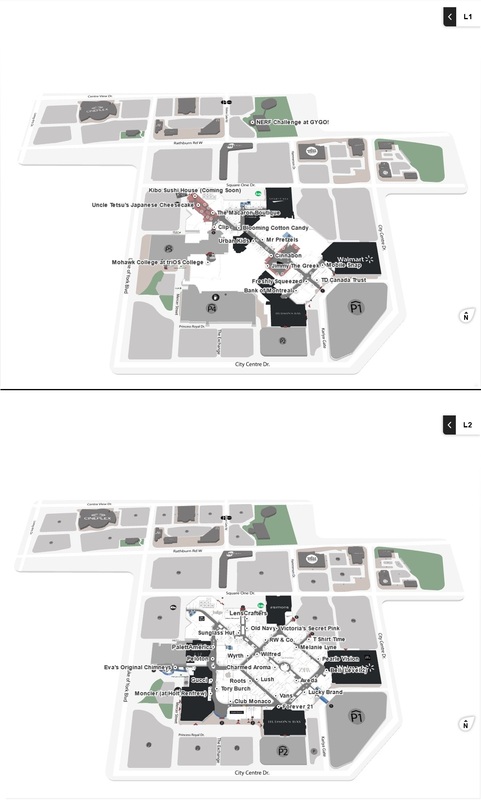 The centre is anchored by Hudson's Bay, Sears, Target and Walmart and features 363 retailers such as Michael Kors, Zara, Harry Rosen, MUJI, Hugo Boss, Coach, Brandy Melville, Forever 21 and many others. The centre is home to a movie theatre, banks such as Bank of Montreal and TD Canada Trust, and Scotiabank. Permanent blood donor clinic is also situated inside the mall. There is a Square Farmers Market that runs over the summer. Newly reconstructed food court, which is known as a Food Central, offers more then 40 place to eat such as Amaya, Big Smoke Burger, Cultures, Canyon Creek, Alice Fazooli’s and Open Kitchens just to name few. Owners Oxford Properties spent $84 million on a renovation in 2013 which included renovation of the mall's common areas, entrances, restrooms, and elevators. New retailers that opened in fall 2013 included Ann Taylor, White House Black Market and Topman/Topshop within Hudson's Bay. Southwest expansion, which will cost $237 million will be finished in spring 2016 and will be anchored by world-class luxury retailer Holt Renfrew. New retailers coming to the expanded part of the mall will be Alex and Ani, Ben Sherman, Club Monaco, Harry Rosen, first Simon in Ontario, Kate Spade, Marc Cain, Papyrus, Rolex by Raffi, Starbucks, Stuart Weitzman and Wolford and will open in spring 2016. Give us your experience with Square One Shopping Centre by writing a short review.